Pasta salad gets a bad rap. It has SO much potential, and yet when I say, “pasta salad”, what comes to mind? Undoubtedly some form of bland, oily pasta, tomatoes, onions, and maybe some feta. If you’re lucky you might find some olives or herbs sprinkled on top. Enough is enough! You can go ahead and erase that image from your memory, because today’s pasta salad is exploding with fresh flavor (and texture I might add)! Today’s recipe was inspired by a sauce, a condiment, a dressing (you get the idea). 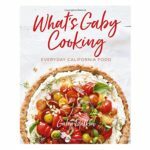 Specifically, I’m talking about What’s Gaby Cooking, aka the queen of sauce! Ok ok, I just made that up . . . but seriously, Gaby does have an amazing line of salsas and seasonings at Williams Sonoma! 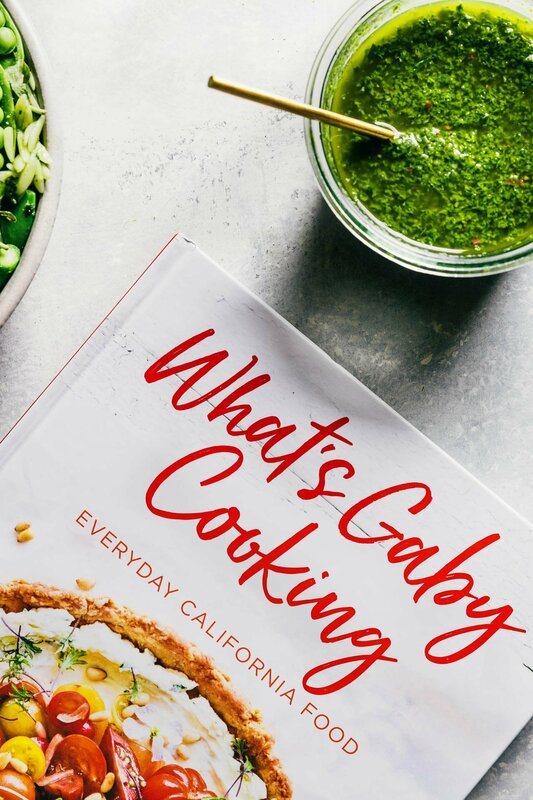 These past few weeks, Audrey and I have been cooking our way through Gaby’s new cookbook, and stumbled upon her basil vinaigrette. Gaby says she eats about a gallon of it a week, and I can see why. It was definitely a, “I wanna put this sh*t on everything” moment. 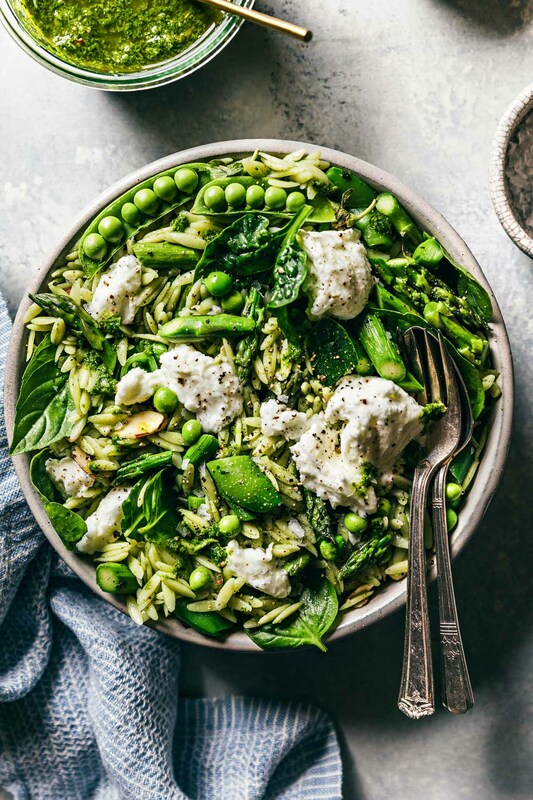 This green orzo salad with basil vinaigrette is exploding with flavors and textures like asparagus, snap peas, spinach, basil and buffalo mozzarella! 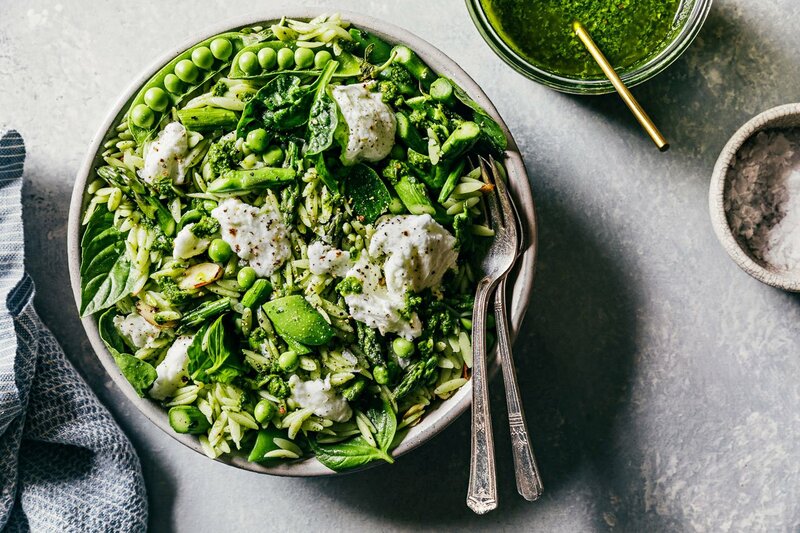 Never bring a boring pasta salad to a gathering ever again!! In a high-powered blender, combine the shallot, basil, garlic, red pepper flakes, olive oil, vinegar and salt and blend for 1-2 minutes, until very smooth. Add more salt to taste, along with the pepper desired. This dressing will keep in an airtight container in the refrigerator for up to 3 days. Place a large pot of water on the stove to boil. Once it’s boiling, salt generously. This water will be used to cook the snap peas and then the orzo, so make sure you have enough as directed by your orzo package. Add the snap peas to the boiling water, just for 30 seconds or so, until they turn bright green. Remove from the water with a slotted spoon and transfer to a bowl of ice water to cool. Remove from the water when cool. Trim off the ends and cut the peas into 1 inch pieces. Set aside. Meanwhile, cook the orzo as directed on the package in the now empty pot of boiling water. Drain, rinse in cold water, and spread on a cookie sheet to cool to room temperature. Warm the olive oil over medium heat in a large skillet. Sauté the asparagus pieces until tender. Remove from the heat and let cool to room temperature. 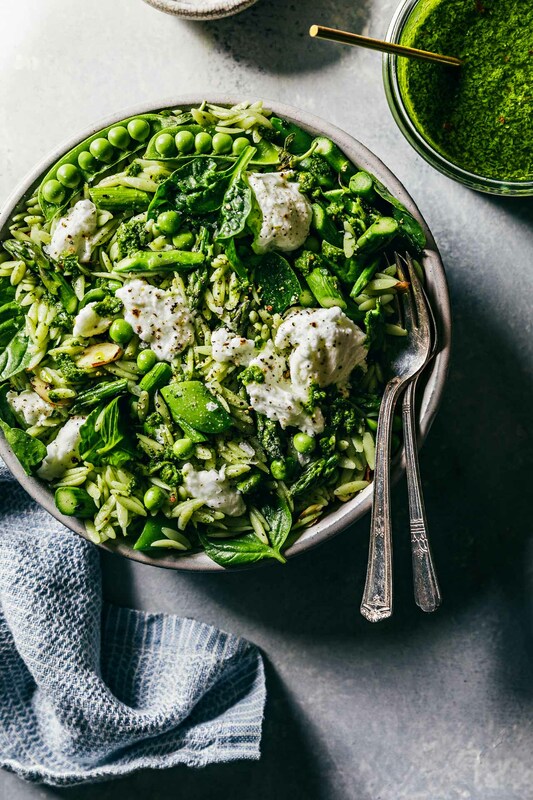 When the ingredients have all cooled, combine the orzo, snap peas, asparagus, basil leaves, almonds (optional) and spinach together in a large bowl. Drizzle the basil vinaigrette over the salad adding slowly and tossing the ingredients together until you get your desired level of dressing. Taste for seasoning and add more salt and pepper if desired. Use your hands to tear the buffalo mozzarella into bite sized pieces and scatter over the salad. Eat immediately. Can be made a day ahead and refrigerated, but I’d add the mozzarella just before serving. I made this on Friday night (but forgot to buy spinach) and it was delicious! Big hit. Now this is one perfect salad. 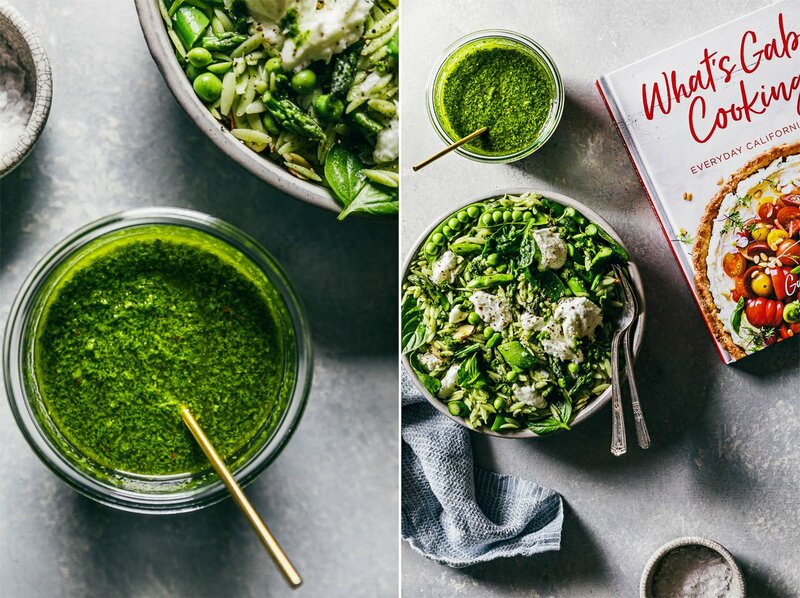 Love the basil vinaigrette and I have a feeling it’s going to be on rotation all summer long! Thanks so much Laura! Really hope you give it a try. Great salad!! I’m obsessed with all of those veggies.